My husband and I recently spent three eventful days in El Paso. We visited early Spanish missions, historic cemeteries, new museums, and other can’t-miss destinations. We would have liked to stay longer in this fascinating city on the West Texas border. We agreed that El Paso is all the richer for its intermingling of Anglo and Mexican cultures. While there was so much to see, (plus a lot of great food to sample), I was most impressed by El Paso’s thriving arts scene. It was especially delightful to tour two very different—but quintessentially El Pasoan —theaters. Originally opening September 12, 1930 to show first-run films and vaudeville productions, the Plaza features Spanish Colonial Revival architecture. It was billed as the “largest theater between Dallas and L.A.,” and was certainly one of the grandest. Years of neglect led to the Plaza’s near-demolition to make way for a parking lot in the mid-80s, but El Paso Community Foundation came to the rescue. The nonprofit entered into a public/private partnership with the City of El Paso. They held a series of fundraising events, including a gala performance by beloved actress Rita Moreno at the Plaza. The community effort raised $1M to save the historic venue, which has now been painstakingly restored to its original opulence. Carefully recreated décor like Mosaic tiles, gold painted columns, murals and other artwork, plus twinkling stars on the auditorium’s ceiling, add to the Plaza’s splendid ambience. 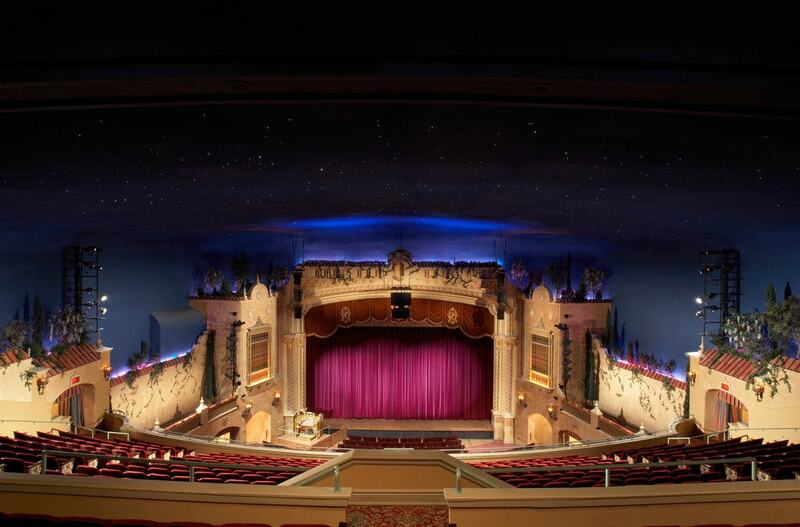 The Plaza Theatre’s original centerpiece, a Mighty Wurlitzer Blaban III Organ (one of only six made) was re-purchased from a private collector and restored to its former glory. Originally used to accompany silent films, the Wurlitzer is now used for symphonic concerts and special events during the year. Some $38M later, the renovated Plaza Theatre re-opened in March, 2006 with a sold-out performance of “Riverdance.” Along with the 2,050-seat Kendall Kidd Performance Hall, a 200-seat Philanthropy Theatre and Alcantar Sky Garden are also available for smaller productions, private receptions, and other gatherings. 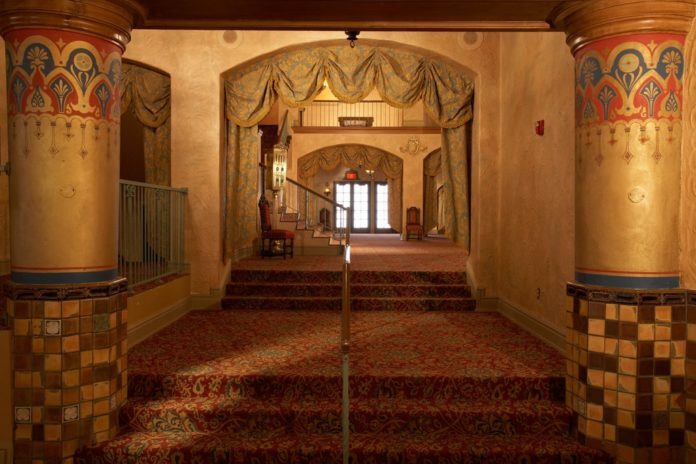 Touring the Plaza Theatre, declared a historical landmark by the State of Texas and dubbed the “Showplace of the Southwest,” is almost as exciting as viewing a touring Broadway show. 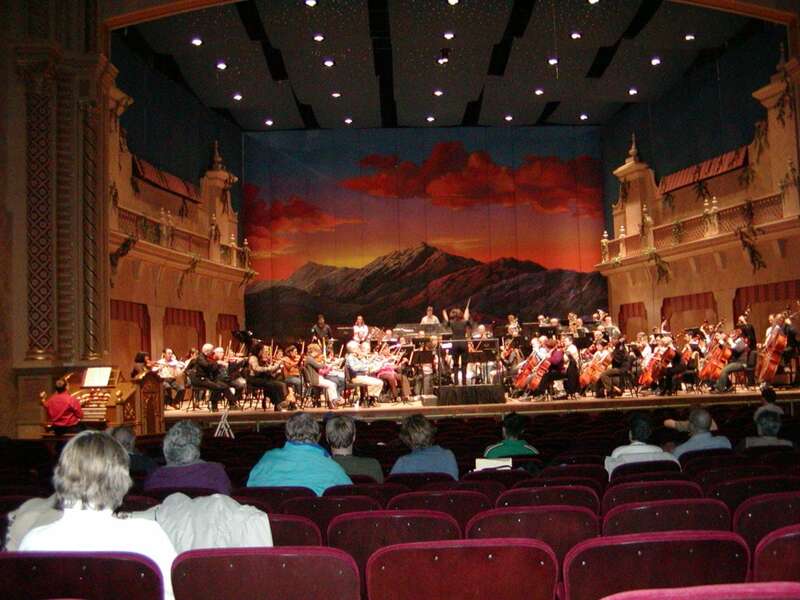 El Paso theater patrons can do both, since the Plaza plays host to tours of blockbuster musicals like “Disney’s The Lion King.” They also present symphony concerts and other community performances, along with the world’s largest classic film festival. Doug Pullen, Program Director for the Plaza Classic Film Festival, led our recent tour of the Plaza. Pullen says the classic film festival, held in August each year since 2008, screened 94 films in 2018. The fest also draws celebrities like Bruce Dern, Sam Elliott, Debbie Reynolds, and Ali McGraw to discuss their iconic films. Last year’s film festival drew record crowds with its emphasis on Borderland movies, showing how El Paso was portrayed in a number of classic films. Our second theater tour took us to a recently re-opened vintage dinner theater, the Adobe Horseshoe. We were in the historic village of San Elizario to visit the Presidio Chapel, our last stop on the mission trail. Our tour guide, artist and entrepreneur Al Borrego, showed us the recently restored venue. Borrego now owns and manages the theater, which recently hosted a well-reviewed Spanish performance of Shakespeare’s MacBeth. A production of “The Nutcracker” will be their holiday offering. The intimate Adobe Horseshoe, owned during its heyday by Janet Protzman, was once an important stop on the dinner theater circuit. Celebrity actors like Bob Denver (“Gilligan’s Isle”) appeared in productions such as “The Odd Couple” there. 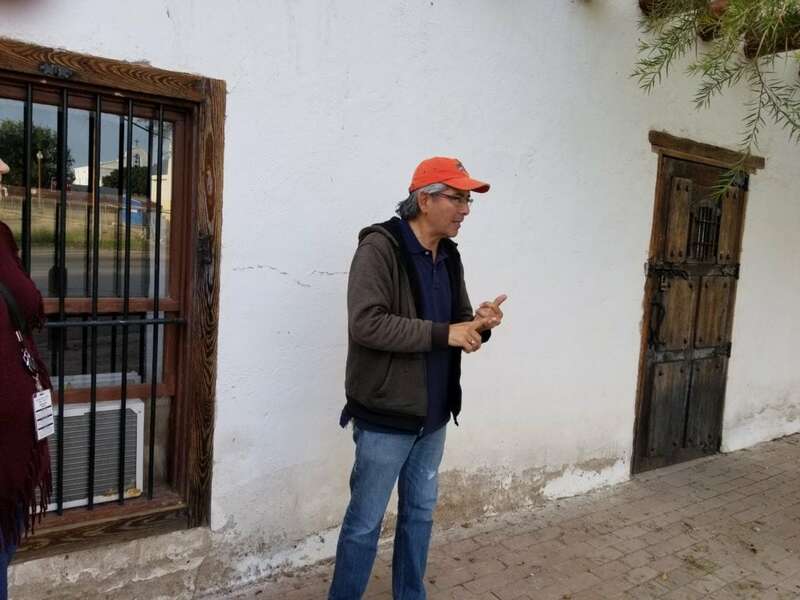 Borrego also took us on a tour of the historic village, where Don Juan de Onate and his 500 colonists celebrated what is believed to be the “real” first Thanksgiving in North America. The colonists joined with the Manso Indians to share their bounty and say thanks for a safe journey in San Elizario in 1598. We also toured the old jail house, now a museum. Billy the Kid helped his compadre Melquiades Segura, who was sentenced to hang the following morning, escape from the prison. 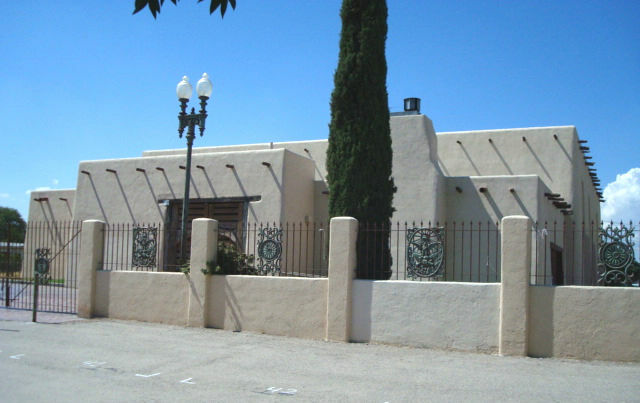 Designated a State Cultural District through Texas Commission on the Arts, the San Elizario Art District boasts several internationally known artists and craftsmen such as Borrego. San Elizario was also the first county seat in El Paso, and site of the county’s first public school house.